Torbjörn Blom´s Projects: House plans are moving on. House plans are moving on. Our house project is moving on even if it have been very quiet on the blog. Today are we planing to order the plans for the building permit. 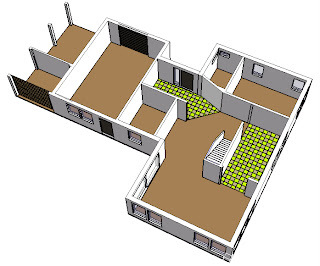 It is allot of drawings and information the building department of Tjörn needs and it is not easier that they need to follow the new building laws that where released last year. I have also continued building on my cad model to represent our different ideas. We have decided on the floor for the kitchen and the entrance. We are planing to use linoleum tiles to make a checker pattern with lime-green and soft-grey. This will stand in contrast to our other soft tones of wood and whit walls. We feel pleased with the layout and we are ready to move on to finalize the drawings for the permit and start doing proper building plans. We have also placed to house on the loot and decided the height of the ground floor. The plan is to send the documents to the building department in the end of January, but that depends on our architects if they can be ready in time.